The maps below are based on three genome-wide SNPs showing high correlation with blue and green eyes and/or fair hair in Europeans. The results obviously suggest that there's an increase in hair and eye blondism from south to north in Europe, with clear peaks east of the Baltic Sea. The three SNPs are rs1667394 (HERC2 gene), rs12913832 (OCA2 gene), and rs12896399 (SLC24A4 gene). 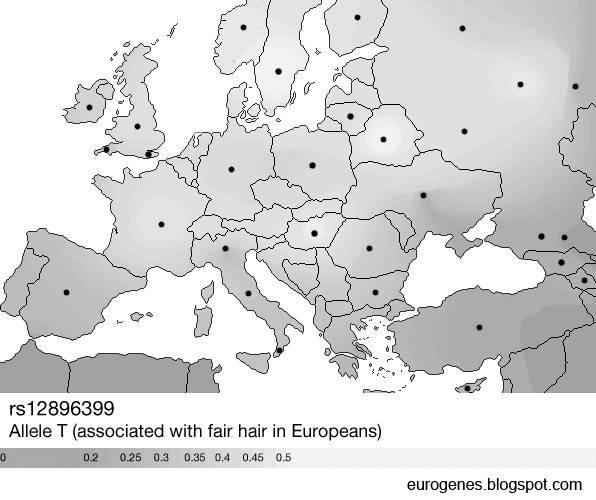 Indeed, I'm a bit taken aback by the very high rate of suggested blondism among the Belorussians and Mordvinians (second highest dot in Russia). This might have something to do with sampling bias. Perhaps most of the 12 Belorussians and 16 Mordvinians used here came from fairer than average communities within their respective nations? I have no idea. In any case, I don't think the picture is too far from reality, because multiple sampling sites from the same general biogeographic zones, but several hundred kilometers apart, are showing very similar results. This can't be a coincidence. It's also interesting to note that the East Baltic peak in blondism genotypes correlates closely with the North + East European genome-wide ancestral component in my latest ADMIXTURE experiment (see here). Perhaps this is where natural selection for these traits was most extreme due to very specific environmental pressures, like lack of sunlight? Maybe this is also where these traits spread from, either gradually or during one or several major migrations? Someone should look into that. Meantime, I'll try and update this post with new maps as more samples come in. Two-rooted lower canines are rare in humans, but they are most commonly found among Europeans, at levels of up to 9%. A new study reveals that this trait reached unusually high frequencies in ancient groups from East Central and East Asia, particularly those of Afanasevo, Scythian, Uighur and Ordos origin (2.8% to 4%). This is a strong indication that such groups carried significant European ancestry, and were possibly the descendants of the same European migrants who took R1a1a and Indo-European culture deep into Asia after the Neolithic (see here). In Table 1, the population variation of two-rooted lower canines is shown for major populations of the world. To emphasize the point that this is a European trait, of the 12,128 individuals included in the table, only 306 express two-rooted lower canines (2.5%) but of these 83% (254) were Europeans. If you include related Asiatic Indian, Middle Eastern, and North African populations, this number increases to 89% (272/306). The presence of the two-rooted canines in East Asia may provide some clue as to the eastward migration of new populations into China and Mongolia. The largest numbers of individuals with this trait are concentrated along the western and northern frontiers of China and Mongolia. Archaeological excavations support the large scale movement of people into this area during the Bronze age (ca. 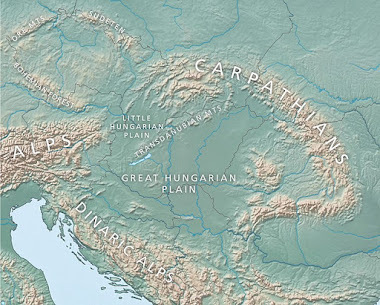 2200 BCE–400 BCE). Burial artifacts and settlement patterns suggest cultural and technological ties to the Afanasevo culture in Siberia, which in turn is linked archaeologically, linguistically, and genetically with the Indo-European Tocharian populations that appear to have migrated to the Tarim Basin ca. 4,000 years ago (Ma and Sun, 1992; Ma and Wang, 1992; Mallory and Mair, 2000; Romgard, 2008; Keyser et al., 2009; Li et al., 2010).